The Double Featurette: Team Sheen: "New Moon" & "Underworld: Rise of the Lycans"
Team Sheen: "New Moon" & "Underworld: Rise of the Lycans"
Lets face it. What I have to say about New Moon is not going to make a difference to you anyway. Either you were super super excited about it and have already seen it, or you would see Robin William's new film Old Dogs before you would see New Moon (aka never). If you happen to be on the fence, I can't really help you. The film is pretty much as you would expect. Copious lack of shirt wearing. Slow motion walking towards camera (while taking shirt off). Voice over. Plot. More Plot. Though I do have to say that whoever picked Robert Patterson's lipstick shades should probably reconsider their career choice - Ronald McDonald much? The first Twilight film I actually found interesting, Catherine Hardwicke seemed to be trying to do something more than just please thirteen year old girls. There was style there, a certain adherence to a film style I think of as "Pastoral": shots of nature interspersed with action for no reason other than to evoke a certain mood, and through these kinds of shots a placing of mood above plot. In contrast, Chris Weitz's film is pretty simple. It tells the story well enough, but that's about it. But really the $64,000 question is Team Edward or Team Jacob? Right? How about option C? How about Micheal Sheen who has played both werewolves and vampires?? Can I be on his team?
" 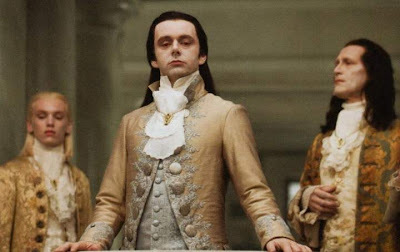 Tricked out in leather and heavy metal hair, the British actor Michael Sheen takes a lively break from his usual high-crust duties to bring wit, actual acting and some unexpected musculature to the goth-horror flick 'Underworld: Rise of the Lycans.' "